Is a Ouija board dangerous? A Ouija board, in the wrong or inexperienced hands can be very dangerous. During a Ouija board session, you are essentially inviting unknown spirits to communicate with you. You don’t know if these spirits are good or bad, or even if they are human. You need to think of a Ouija board as an internet chat room. While there may be some people in there who genuinely want to talk to you or even may know you, the majority are complete strangers. There will be some internet scammers in there or even worse, some people with bad intentions. You wouldn’t go into an internet chat room and just hand out your address and invite everyone you chat to round to your house. Yet using a Ouija board and inviting people to come and talk to you is the equivalent of inviting a complete stranger round. There are two schools of thought around how a Ouija board works. One says that it is the spirit physically moving the planchette. The other says that the spirit possesses the people round the board and then makes them move the planchette to the suitable letters. If it is the second, then you are essentially opening yourself up to possession every time you use a board. Because you never know who or what you are going to contact with the board, this can be very dangerous. There are ways to ensure that you are much safer when using a Ouija board and we will discuss these in a future blog post. If you start to notice any of the above symptoms, you need to close down the board immediately. You should immediately stop using it and burn both the board and planchette as soon as possible. 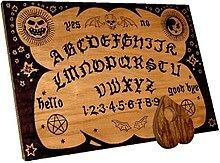 Occasionally you can become possessed or find that a spirit forms an attachment to someone using the board. In this instance the spirit will affect that person even when they are not using the board. Again, if you notice any of the above symptoms you need to take action immediately. Burn the board and planchette and seek out a priest or exorcist to do a blessing of that person. Next: Next post: How does a Ouija board work?